I remembered seeing this recipe recently in my recipe folder. Woohoo -- we had all the ingredients, and it was a "one-pot" recipe! I whipped this up (1/2 the recipe) in about 7 minutes, and 35 min later, we had a delicious bourbon-y dessert; even more bourbon-y with the strong bourbon whipped cream we made. 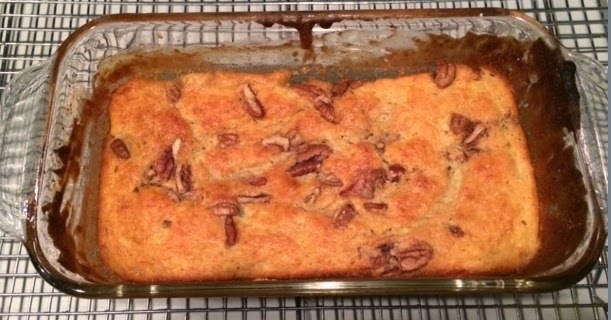 Ingredients: butter, sugar, an overripe banana, egg, whole milk, flour, maple syrup, brown sugar, bourbon, pecans, baking powder and salt. Not a beautiful dessert, but it was exactly what I wanted.